"Villa Florence 1272" was created from the transformation of a former convent dating back to 1272 and is situated 496 meters above sea level in the Natural Park of the Monte Morello and is surrounded by an estate of over 8 acres of land with oak, cypress and pine trees, as well as olive groves and fruit trees. Sunny location that also offers a very relaxing atmosphere, as well as a breathtaking panoramic view of 360 ° over the Florentine hills, just 15 km from one of the most beautiful cities of the world: Florence. On the estate, where you will enjoy an atmosphere of past times, you will also find all the elements that will make your holiday memorable. The villa rental is well and tastefully furnished and is very comfortable. The colors and details found in the villa, highlight the passion and care with which the restoration (2011) was carried out. The stone farmhouse is spread over several levels and the property, which is completely fenced in, is characterized by a well-tended garden of approx. 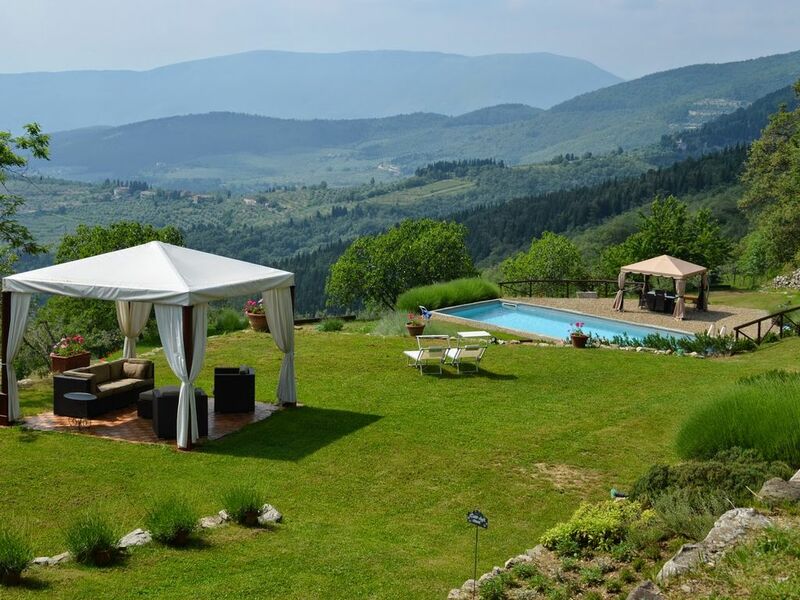 2000m2 and surrounded by aromatic stones and equipped with table tennis and other outdoor games. Guests can also enjoy a gazebo with sofa and armchairs, chaise longue, built-in barbecue and terrace with panoramic views. The beautiful swimming pool (5x12, 1.40m deep) (01/06-30/09) with Jacuzzi (seats 6) with water that can be heated from 19 ° to 40 ° and with color therapy is reserved for the exclusive use of the guests, and completes the setting for this little corner of paradise. On the property there is a small farm with several animals locked in special enclosures, such as a horse (available for short walks), donkey, chickens, geese, ducks, goats and rabbits. Inside the property there is also a small natural lake. All rooms are equipped with a safe, satellite TV and a radio. The entire house is protected by an alarm system with private security and surveillance from external cameras. Included in the price: baby-bed and high chair, Wi-Fi, 4 hours/ week of maid service. Guests can also enjoy free use of the produce from the vegetable garden. To be requested when booking at to be paid for on location: domestic help, chef, breakfast, babysitting, cooking courses, wine tour, tasting wine, guided tours of the cities of Florence and Siena, welcome cocktail, breakfast service, shopping service, transport to/from the airport to be requested at time of booking and pay on the spot. Central heating. Parking for 6 cars in the property (not covered parking), but controlled by closed-circuit cameras. PLEASE NOTE: only small pets accepted. ACCOMMODATION: (350 m2) Gr. fl. : 1 panoramic double bedroom with small cooking area (mini-fridge and microwave), private bathroom with shower and an exclusive terrace. 2nd fl. : room with fireplace (satellite TV) and dining area, kitchen (oven, freezer, dishwasher, toaster, coffee maker and American coffee machine), laundry (washer and dryer), small living room, 1 panoramic double bedroom with bathroom with shower, 1 single bedroom, 1 panoramic double bedroom with en suite toilette in addition to 1 bathroom with shower. Annex: 3 double bedrooms each with bathroom with shower and air conditioning.LOCATION: within a radius of 4 km there are 3 restaurants, 7 km Sesto Fiorentino (all kinds of shops), 15 km Florence, 59 km Montecatini Terme (thermal baths), approx. 60 km the Chianti area, 80 km San Gimignano, 85 km Lucca and 98 km Siena.